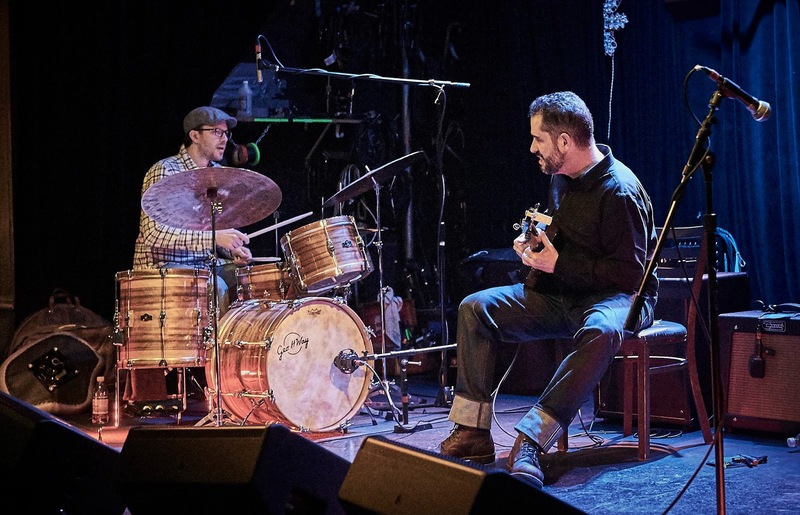 The “trio” in Charlie Hunter Trio is a bit of a misnomer when it came to the group’s recent show at Tractor Tavern in Seattle. The full line-up of musicians included a drummer, a saxophone player...another saxophone player...and in charge of it all, a man carefully packing three instruments onto one guitar body. The first set, starting with “Who Put You Behind The Wheel?”, was largely focused on the Charlie Hunter himself, and rightfully so. Carter McLean (drums) and Rob Dixon (saxophone) hold their own, but Hunter is a one-man show no matter what. He and his seven-string guitar are their own full-sized band: Hunter plays bass with his thumb on the lower strings, while strumming rhythmic chords and bouncing out melodies on the upper strings. After a few songs with just the trio, Seattle-based saxophone hero (and member of Garage a Trois, one of Hunter’s prior acts) Skerik arrived onstage and had a prominent role for the remainder of the evening. The songs alternated from up-tempo funky jazz to slow, methodical blues every other song, with large swaths of improvisation throughout. 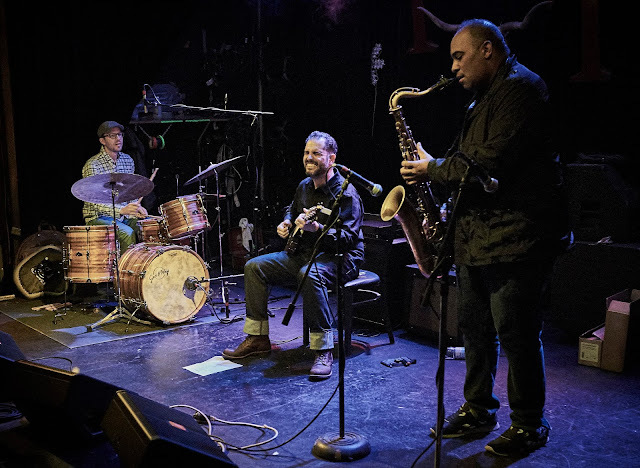 The blues numbers started out with just Hunter plucking, then slowly added a light kick drum or a hi-hat until they welcomed one or more saxophone players to play. 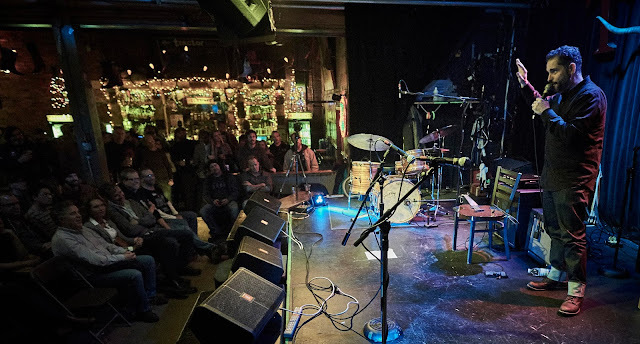 Often Hunter sang along, microphone-less, sometimes scatting and sometimes using real words that may or may not have actually belonged to that particular tune until that moment. Technically a seated show, this did not stop a small contingent of Hunter enthusiasts from respectfully gathering at the side of the stage to dance along to the free-floating guitar solos. Hunter seemed to enjoy the music just as much as the audience. 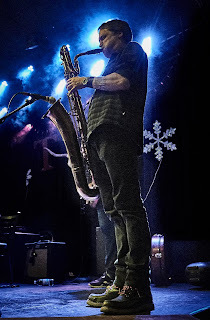 At times he would be watching McLean or the saxophones, smiling, seemingly oblivious to the fact that he was at that moment holding down one to three different components of the music. Hunter’s face often expresses a sentiment like, “Wow, guys! Did you just hear that neat sound that came out of this instrument?” It is so uplifting to see child-like joy from an industry veteran and to hear its musical results as well. During one potentially jarring transition from a 70s-funk infused jazz number back to lowkey blues, Hunter prefaced the jump, almost apologetically, by saying “we like to go from 70s to 20s.” Really though, all of this sounds fresh in the hands of Hunter, and the next few decades of his music should be just as entertaining.